I hope this page provides some answers if you are wondering why you should join the Florida Poly chapter of UFF. If you have any more questions about UFF Florida Poly, I encourage you to stop by my office or to contact any of the UFF Poly officers listed on the home page. We are all happy to share why we think the union is important as well as listen to any concerns or ideas you might have. All conversations outside of Florida Poly e-mail are confidential. UFF is an affiliate of the Florida Education Association, the National Education Association, the American Federation of Teachers and the AFL-CIO. Together our millions of members are fighting for high quality public education and democracy in D.C. and across the nation. 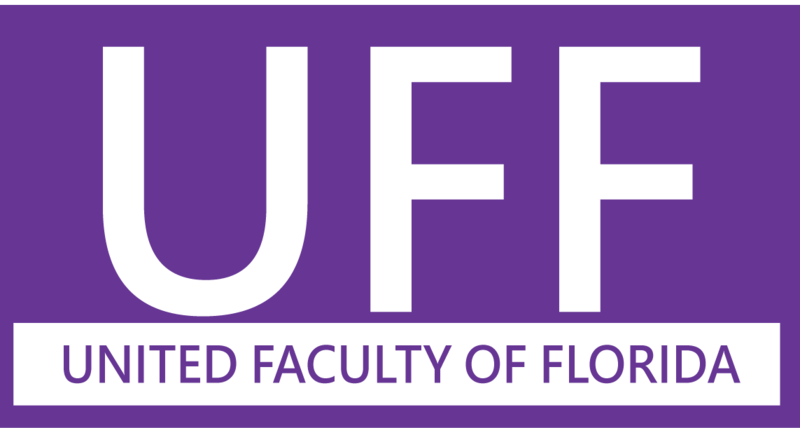 UFF represents more than 20,000 faculty members at all 12 public universities, at 11 colleges and community colleges, and at St. Leo University. We advance and protect faculty interests and rights through collective bargaining. The issues we advocate for include: continuing multi-year contracts; benefits, such as paid family leave and sabbaticals; salary increases; due process; and intellectual property rights. We fight for resources for teaching, research and service that will help our students and the public we serve. We provide legal and disciplinary rights for members. If UFF members are treated unfairly, we provide resources and support to ensure due process. We lobby for faculty, graduate employees and students in our state government. We fight for higher education funding, health insurance and retirement benefits, and many other critical issues impacting higher education in Florida and your ability to effectively teach and conduct research. Only UFF members can serve on collective bargaining teams and set priorities for negotiations with your Board of Trustees. Contract enforcement teams represent members when their contractual rights are violated, but only if you are a member at the time of an incident. Members are entitled to have representation at investigations (including if you are yourself under investigation or if you are a witness), as well as any contractual violations or disciplinary action (including termination). Member-volunteers support their colleagues and have access to professional staff and attorneys when needed. Non-members must represent themselves or retain private legal counsel in the event they are placed under investigation or are disciplined or discharged. What is the “bargaining unit” and how is it related to Florida Polytechnic University? The bargaining unit is the group of Florida Poly professionals who are represented by UFF Florida Poly in collective bargaining and other negotiations with the Florida Polytechnic administration and the Board of Trustees. Faculty belonging to the bargaining unit — whether they are dues-paying UFF Poly members or not — are legally protected by the terms of employment specified in the Collective Bargaining Agreement (CBA). Who is in the bargaining unit? Membership in the bargaining unit is dependent upon your position title. What are the UFF membership dues, and who determines them? Membership dues are currently 1% of your regular gross salary. The dues rate is set by the UFF Senate, a state-level body in which each UFF chapter is represented by senators elected by the chapter. participation in an organization that represents your interests as an academic professional, at Florida Poly, in the State of Florida, and nationally. Yes, some or all of your dues may be tax-deductible as an itemized business expense. Download, Complete and Return the Application Today!